Anwar Ibrahim : A Step Away From Greatness. Ten years ago I said my final goodbye to KL. I now call Australia home. Every day in many ways I and my family have been the better for doing so. If I look around me I am comforted by the presence of my wife and son and the life that we now lead. Not a life of great comfort or of plenty, but certainly a good,decent life. Even as old age takes away from me much of what I once took for granted – good health and the ability to take care of myself and those that I love – the future still holds no great uncertainties for me……only the promises of a good life in the twilight of our remaining years. Australia will take care of me as it is taking care of me and my wife now. We have enough to eat, a roof over our head and the means to allows us to enjoy what is left of our life in comfort and with dignity. And in times of needs I have friends to help me through the tiring times. My life is only different from yours by the slimiest of margins and yet no two of us have lived similar lives. We are all different and yet we are all alike for in the end we all want the same things – family, love, comfort and the providing of first, our needs, and then if we can, the getting of our wants. Regardless of race, religion, gender and whatever divide that defines us in life we are all of the human race. The lot of our brothers and sisters are also our concern…we are after all our brother’s and sister’s keeper…and once in a while, there will be among us people of courage and greatness. Such a person is Anwar Ibrahim….he is just a step away from greatness. The challenge for Anwar now is whether he can achieve that greatness that is tantalizingly a step away. The only thing that will stop him is his own self and first he still has to walk free from the shackles imposed upon him by others who are threatened by his presence. Anwar is made in the same mould as us. He is human like us …he laughs, he jokes, he makes fun of himself. What makes us happy makes him happy. What inspires us inspires him. No matter what he has gone through, his family is always with him just as ours are with us through the good and the bad times. We sometime succeed and we sometimes fail…so does Anwar. We all see a bit of ourselves in Anwar Ibrahim. His trials and tribulations have become ours. When Najib prosecute and persecute Anwar Ibrahim, the is also prosecuting and persecuting us. When our judiciary are compromised by the demands of their political masters to incarcerate Anwar, a part of us goes to prison with Anwar and it is our judiciary that has been compromised! And today when the opposition is denied the leadership of Anwar Ibrahim, we are also denied the leadership we need to to bring our people together and move ourselves towards changing our country’s political malaise. Thank God we still have Mahathir and Lim Kit Siang. 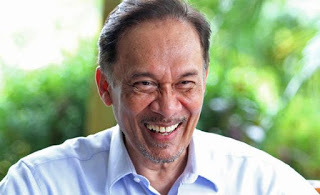 There is a palpable sense of disgust among many Malaysians in the manner that this BN government under Najib Razak has chosen to persecute Anwar Ibrahim for their own political gain. If, as this BN government has so many time intoned, we are a democracy, and if, as Najib has so many times claim, he is a Bugis Warrior, then should he not fight his political battles with Anwar Ibrahim on a level playing field? Najib leading his BN government in Putrajaya and Anwar Ibrahim leading the opposition – both to do battle in Parliament and on any other democratic platforms responsibly and without fear or favor? It is our loss and that of our nation that Najib choose to do otherwise. He choose to fight his political battle with Anwar as cowards do…with the assist of a PDRM that fawningly second guesses the needs of it’s political masters with a regularity that deserves only contempt from us and a complicit judiciary that shames itself by pandering to the wishes of this Umno led BN government for their own immediate personal and financial gain! Anwar Ibrahim is not a criminal. He has been jailed for his ability to put the fear of God into Najib for Najib’s corrupt ways of doing government. He has been the voice of reason needed to bring our people together. He has the quality of leadership that is needed to lead public opinion away from the politics of negativity to one of positivity. Take us away from race and religion and go towards unity in diversity. Take us away from what we have today – a corrupt and self serving government, to what we want it to be tomorrow – an open, responsible and accountable government. And Anwar Ibrahim will do this because he has built his political image in our image. What we wants, he wants. What we want our country to be, he too wants. Anwar Ibrahim knows that his strength comes from us and our strength comes from his presence. But for now we will have to wait for Anwar Ibrahim to be with us once more. He will be back among us in the fullness of time. Stronger for having gone through another period of trials and tribulations. I hope in the conduct of his personal affairs he will be much wiser than he has been in the past and in the management of all things politics, I hope he will understand his responsibility to our people, our nation and to our future that will transcends his personal self. And may God give him the strength to do that! By Hussein Abdul Hamid|2018-07-14T05:44:07+08:00January 14th, 2018|Categories: Uncategorized|Tags: Anwar Ibrahim|Comments Off on Anwar Ibrahim : A Step Away From Greatness.